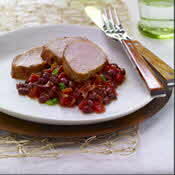 Pork and Beans is given a modern touch as caramelized honey-glazed pork tenderloin is served on a bed of adzuki beans and tomatoes. Mix honey, fish sauce, lime juice, 2 teaspoons of the smoked paprika, 1 teaspoon of the garlic powder and red pepper in small bowl until well blended. Brush pork with glaze. 2. Roast 20 to 30 minutes or until desired doneness, brushing with glaze halfway through cooking time. Let pork stand 5 minutes before slicing. 3. Meanwhile, cook bacon in large skillet on medium heat until crisp. Add tomatoes, tomato paste, remaining 1/2 teaspoon each smoked paprika and garlic powder, ginger, sea salt and pepper; cook 8 to 10 minutes or until slightly thickened, stirring occasionally. Gently stir in beans. Cook 2 to 3 minutes or until heated through. Slice pork on an angle into thin slices and serve over bean mixture. Garnish with green onions. Adzuki beans are small, russet-colored beans with a sweet, nutty flavor. They are often used in Asian cuisine in confections. They can be purchased dried, canned or powdered in Asian markets or online specialty stores.